Get My DVDs In iTunes! "Why is it so hard to get my DVDs into iTunes?" "I payed for them already I should be able to import them some how, right?" iTunes would prefer that you buy your favorite DVDs again conveniently from the iTunes store. Paying for a movie twice is crazy, although it might be one of the easier methods, I have a better recommendation that will save you money. I can't blame them, but the film industry has gone to great lengths to ensure content protection. Without getting too technical, content protection makes sure no one can copy a VHS, DVD, Blu-Ray or any type of streaming media. As a result people with good intentions that may want to import their movies into iTunes for convenient viewing around their home get stuck. Maybe you'd like to save Frozen to a tablet so your kid can have something to watch on a long road trip. I have personally run into this problem over the past few months. Go figure my two-year-old daughter loves Frozen. 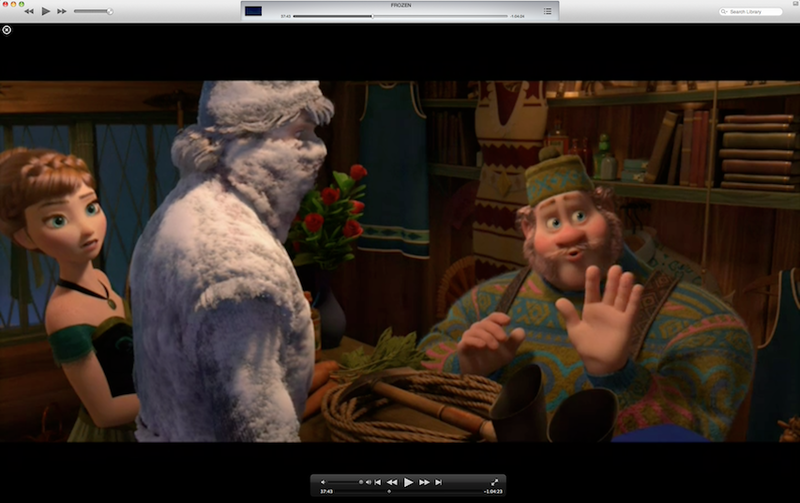 Today I was able to import Frozen into iTunes. I was also able to save it to my hard drive, smart phone, and tablet. The topic of DLNA servers, DLNA compliant devices, and UPnP apps is closely related to this but not always necessary. I'll save that for another post. Just be aware that DLNA will allow you to store all your media in one location and allow you to stream that media simultaneously to multiple device on your home network. It's pretty slick. But I digress. Back to the topic at hand which is ripping DVDs. Are There Any Super Simple & Free Software Packages That Can Do This For Me? Nope. There are free software downloads available like Handbrake or Mac The Ripper. But they are not super simple and I can't recommend them to non-tech-savvy people. I have come across a super simple software package to solve this problem but it costs money. The price is equivalent to buying roughly three new Blu-Rays. Having software that is simple and easy to navigate is important here. If you have a degree in computer science you can ignore this recommendation. For everyone else I think paying for this software is worth your while. I have been using it since late 2013 and I think you'll like it. In fact I have been in contact with employees of MacX DVD Ripper Pro to ask questions. And guess what? They have actually written back with answers. None of the free software download methods come with tech support. You're on your own with those guys. I'll post my email exchange below with Alice where I learned a good tip for ripping Frozen. In short, there is a feature called "safe mode" that proves to be a great feature. I even made a YouTube video series about the DVD ripping process and how to use this specific piece of software. Look for that video series in the embedded player below. Vudu, Digital Copy & UltraViolet? Some DVDs and Blu-Rays do come with something advertised as a "Free Digital Copy". That's great if you have constant access to the internet everywhere you go (see road trip example above). The truth is Vudu, Digital Copy and Ultra Violet don't actually give you a digital copy. They give you permission to stream. I've used Vudu and Digital Copy and as far as I can tell they don't actually give you a copy of the movie file to store on your hard drive. The problem is if you want to go for a long road trip or live anywhere with limited internet access those services won't help you. If you need a simple way to convert your DVDs into movie files that can be viewed on multiple devices and stored locally on a hard drive of your choosing I have a recommendation to make. I've done my homework and now I'd like to share my solution with you to make your life a little easier. If you scroll down to the bottom of this post you'll see two download links. One that works for Mac and the other works for PC. Wait! Are You Some Kind of Software Salesman? Not really, but I guess I kind of am now... If you read my about page you will see I started creating how-to videos on YouTube back in 2011. My main purpose for creating content on the internet is to help people. I started making how-to videos that I thought people would find informative and helpful. I have never sold software before. In fact I work full time in Pro AV as a system designer. I'm not really the sales type. But I will say that if you click on this link and buy this software for your Mac or PC I will get a small commission. I gotta be honest with you. I don't "sell software" for a living but as a blogger and Certified Technology Specialist I do recommend this specific piece of software to folks who don't know where to begin and are looking for an easy solution. As mentioned earlier the free software available for ripping don't offer tech support. They tend to be good for very tech savvy people who have no problem downloading proper codecs, calculating bit rates, and determining file sizes and resolutions. 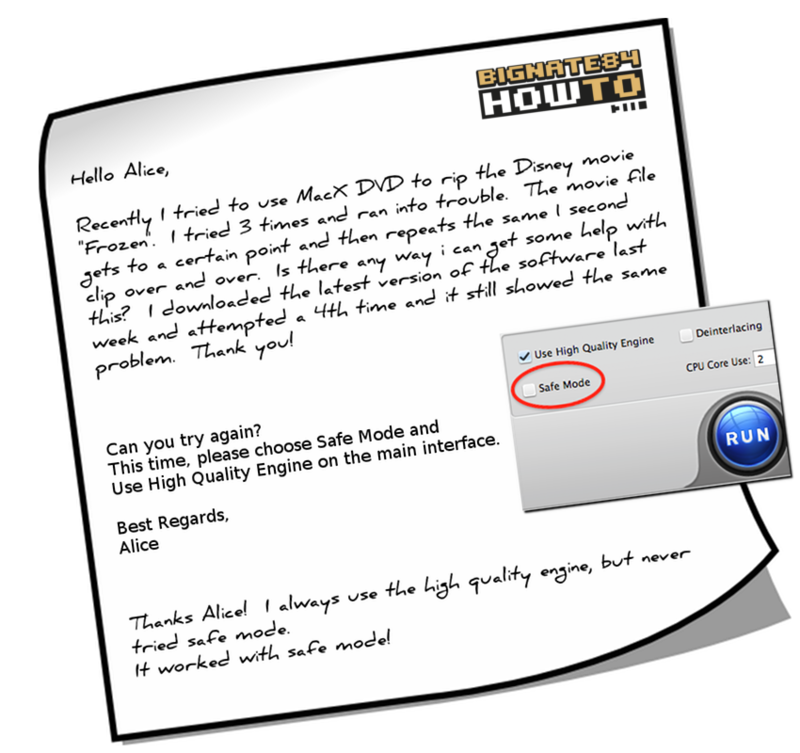 For everyone else trying to import their DVDs into iTunes or any other type of media management software I would recommend avoiding the configuration hassles and buying MacX DVD Ripper or WinX DVD Ripper. You'll be able to easily choose a predetermined output profile based on your intended use and desired file size. Here is a brief but helpful email exchange I had with Alice of Digiarty. 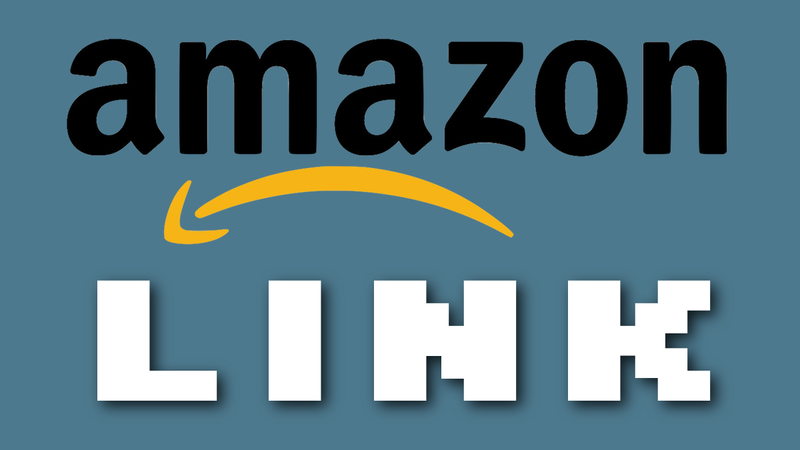 What Product Download Works Best For You? I hope you found this information helpful. So far I have ripped 34 DVDs and I'm currently working on 35 (Zero Dark Thirty) as I'm writing this post. You can read more information about these DVD ripping products for Mac and PC by clicking on the respective links below. The product pages will go into more detail about the supported file formats and specifications. Thanks for reading my blog :-) Now I'd like to hear from you. How would you personally use one of these products? In the comments section below tell me what product you would pick and what devices you would use to view your movies. How would software like this make your life easier? For me it's all about convenience. I'm always just a couple clicks away from watching any of my movies. No disc required.